This was a good showdown with the Sigma 85mm f/1.4 EX Vs. Bell & Howell 85mm f/1.4. 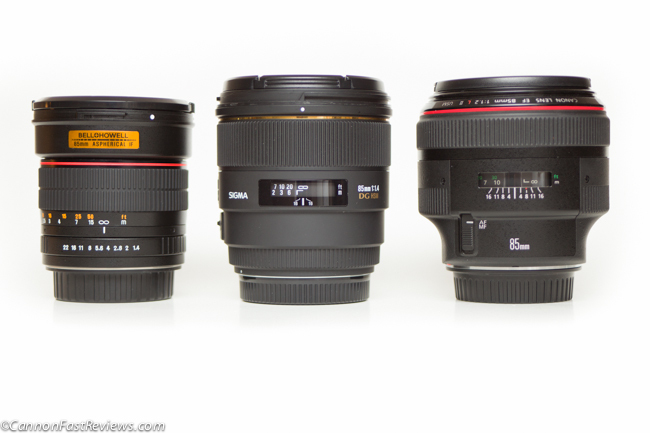 Both lenses are extremely good but both give options for your needs. In the end if you need auto focus go with the Sigma 85mm f/1.4 EX DG HSM but if you are on a budget and can manage a manual lens, it seems the Bell & Howell 85mm f/1.4 Aspherical IF MC has a slight optical edge. You can also look on Ebay to see if there are split focus screens that will help you manual focus the Bell & Howell lens. Posted in 85mm Lens, Bell & Howell Lens, Blog, Bower Lens, Canon Eos Mount, Good Landscape Lens, Good Portrait Lens, Nikon F Mount, Pro Optic Lens, Rokinon Lens, Samyang Lens, Sigma Lens, Telephoto Lens, Worth Looking For and tagged with Bell & Howell vs Sigma 85mm, Best 85mm Sigma Bell Howell, Rokinon 85mm 1.4 comparison Sigma, Samyang 85mm 1.4 vs Sigma 85mm f/1.4, Sharpest 85mm 1.4, Sigma Bower better bokeh. RSS 2.0 feed.